Nick Grimshaw is a British television and radio presenter. 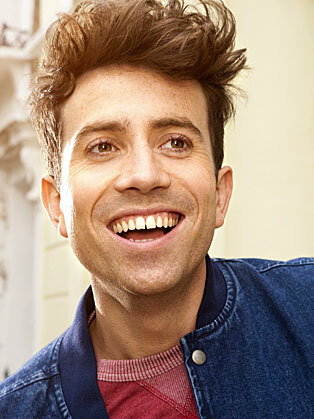 As well as hosting various shows for BBC Radio 1, Nick Grimshaw is notable for his work on Channel 4, E4, BBC One, BBC Two and Channel 4 youth strand T4. Nick Grimshaw is one of television and radio's hottest new presenting talents. He is a regular on BBC 2's Sound, Channel 4, E4 music and Freshly Squeezed. His infectious enthusiasm, musical expertise and membership of the infamous Camden music scene make him extremely popular with younger viewers and at 22 he brings a much needed breath of fresh air to terrestrial television. He is a huge new music fan, and always keeps on top of the 'next big thing' by attending as many gigs as humanly possible. His credits include the first TV interviews with artists such as the first Jack Penate, Remi Nicole, and Kate Nash. Nick Grimshaw co-presents Switch on Sunday nights on Radio 1, and Sound on BBC2, both with Annie Mac.